We're picking blackberries tomorrow. After that, I'll put together a cracker-making tutorial. Nothing looks more elegant than an artisanal crisp with herbs. Or, as my family calls them, those crackers that aren't as buttery as Ritz but are a lot cheaper. I'm excited for the cracker tutorial because Ritz and all such crackers contain dairy which is off-limits for my allergic son, so perhaps I can fiddle with your recipe to make it dairy-free. I am so excited about your tutorial!! An "artisanal crisp with herbs" sounds so much more tasty than Ritz anyways! 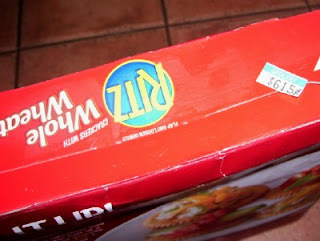 Is that a price tag on the box? Must be from the Carribean! You read my mind! I was going to e-mail you for your cracker recipe. ... off to swimming lessons again. Enjoy blackberry picking! I can't wait:) I love making yummy spread, it'll be great to have fancy (not $5 a box) crisps to go with them! Please tell me those didn't cost $6.00 stateside!! Our most expensive store here in NE Ohio would charge $3.50 for the same crackers!! My son is also anaphalactic to dairy and he can eat ritz. One of the few things he CAN eat.